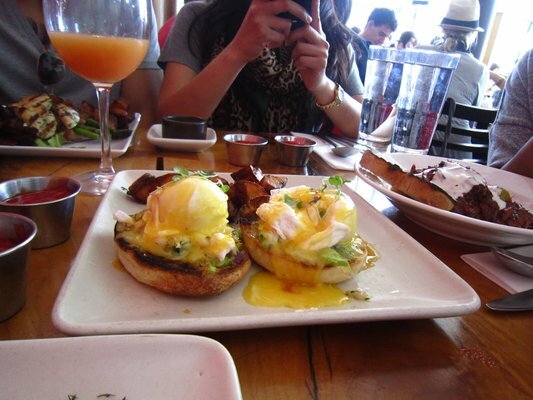 After hearing about this place for some time, I finally went for brunch this past Bay-to-Breakers Sunday. From the name, I thought it’d be a divey sort of diner, but instead it was a modern, lively restaurant, and the large windows facing the street allowed abundant natural light to come in. The food itself was fresh and tasty, done just right, and likely organic and locally-sourced, in the vein of a Plow or Serpentine, which are a few of my favorite brunch spots. S and I were in the neighborhood early, about 45 minutes before we were to meet our friends, and were fortunately able to put our names down on the sign-in sheet for a party of four. Good thing, because when we came back after walking around a little, there was a big crowd of people waiting. There are a couple of nice wooden benches out front, so S and I sat in the sun, people-watched and waited. After informing a host that the rest of our party had arrived, we were seated within ten minutes. The chairs were comfortable – S said they were reminiscent of an Asian style – and the wooden tables were spacious. 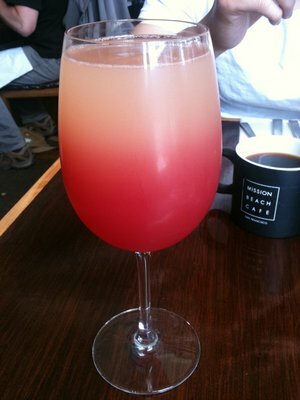 We started our meal with mimosas (similar to the one shown below) – mine was orange and pomegranate I think – which came in large wine glasses. At $12/glass for the large size, they aren’t cheap, but one is plenty. S ordered the eggs benedict with crab, and I got the “braised short rib and sweet potato-apple hash, two fried eggs, horseradish creme fraiche.” I was slightly worried that the hash would come with those big pieces of fried potatoes that I don’t like, but I needn’t have, since everything was finely chopped and very tender. 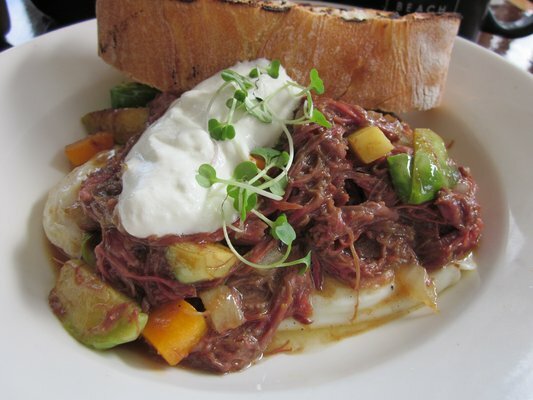 The short-rib hash was delicious, about $15/plate, and just the right amount. It reminded me of something that Serpentine might cook up. All in all, it was a fine meal and a nice space to have one in, and the cost (about $35/person, including drinks and tax/tip), while on the pricier side, isn’t prohibitive, particularly if this is a once-every-few-months place. This entry was posted in Brunch, Restaurants and tagged Brunch, Mimosas, Mission. Bookmark the permalink.